A theme consists of a global style sheet that provides a uniform look and feel for all of the pages in your portal. The goal of a theme is to let you change the look and feel across all of your portal pages at one time. You can customize, preview, and publish your theme, as described in the following sections. Customize, preview, and publish the theme for your portal in the theme editor. Select Publish > Portals in the side navigation bar, select your portal, and click Theme on the landing page. When editing a portal, click Theme in drop-down in the top navigation bar. 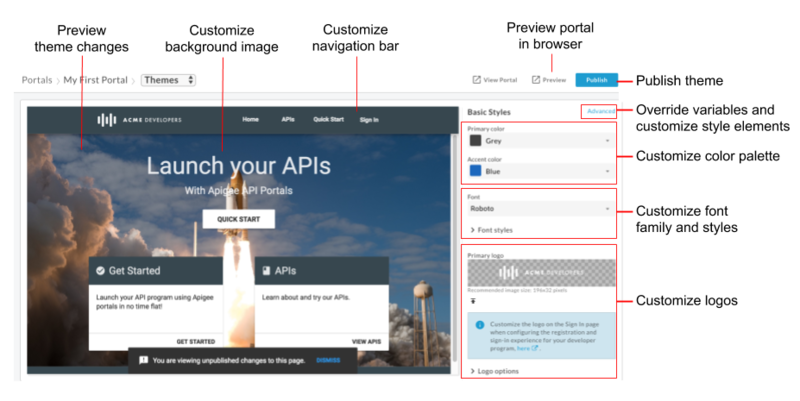 In addition, you can easily customize the API card on the APIs page. A majority of the base theme style rules defining the site's appearance are based on angular material design. Angular material design uses grid-based layouts and consistent components and styling to provide a unified interactive experience. SCSS is compiled and converted to plain old CSS before the content is rendered on the web page. An angular material stylesheet, material theming SCSS file (material-theming.scss), is used by the base theme. This stylesheet declares variables, functions, and mixins that can be overridden using custom variables and SCSS sections, as described in Customize the theme using the advanced theme editor. Based on your UI theme selections, a number of SCSS variables are declared that define typography, color, and layout styles and are consumed by the base stylesheet. You can override the variables listed in the theme variable reference. The majority of the API reference documentation styling is defined outside of the base theme. Apigee recommends that the API reference documentation styling not be changed. Customize the color palette using the basic styles editor or by overriding theme variables. 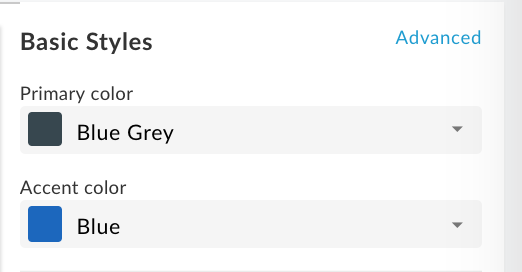 The color palette definitions for the integrated portal are grouped into the following categories, which are defined using material design color styling in the base theme. Quickly customize the primary and accent color palettes using the basic styles editor. To customize the primary color, in the Primary color drop-down select a color or click Custom and enter a custom hexadecimal color value in the text box. 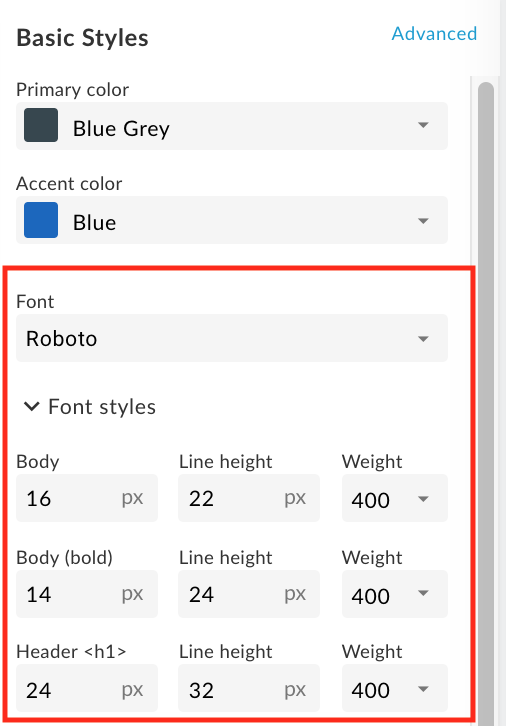 To customize the accent color, in the Accent color drop-down select a color or click Custom and enter a custom hexadecimal color value in the text box. View your changes in the preview pane or click Preview to preview the portal changes in a browser. Note: You can click through your portal navigation in the preview pane to view the changes on all pages. Click Publish to publish your theme. You will be prompted to confirm the update. To customize the color palette by overriding theme variables, access the advanced theme editor and include one or more of the following variables with adjusted values in the Variables section to change the primary, secondary, accent, or warning message colors, respectively. See About the color palette categories. View the contents of the imported material theming SCSS file (material-theming.scss) to identify the predefined color variables (such as $mat-grey). The numerical values indicate the shading values for the default, lighter, and darker elements, respectively. Customize the font family and styles using the basic styles editor or by overriding theme variables. Quickly customize the font family and styles using the basic styles editor, as shown in the following figure. To change the font family, select a value in the Font drop-down. To change the font styles, expand the Font styles section and edit the styles, as required, including the font size, line height, and font weight for the desired HTML elements. To customize the font family and styles by overriding theme variables, access the advanced theme editor and include one or more of the font family and style variables with adjusted values in the Variables section. Cutomize the logo in the navigation bar for desktop and mobile displays. Depending on the width of your browser, you may see the desktop or mobile version of the logo. You cannot delete the primary logo, you can only replace it. If you do not specify a logo for the mobile display, the primary logo is used by default. If your desktop and mobile logos are a different size than the defaults, they are resized automatically to 60% of the height of the navigation bar. You can adjust the height of the navigation bar, as described in Customize the navigation bar. Obtain one or more copies of your company logo that would be suitable for use. Refer to the previous table for recommended sizes. a. Under Basic Styles in the right pane click under the Primary logo field. b. Browse for the desktop version of your logo in your local directory. c. Click Open to upload the file. a. Under Basic Styles in the right pane expand Logo options and click under the Mobile logo field. b. Browse for the mobile version of your logo in your local directory. Click Save to preview your changes in the left pane. Click Publish to publish the changes to your portal. Confirm the operation when prompted. Obtain a copy of your company logo that would be suitable for use as the favicon. Refer to the previous table for recommended size. Under Basic Styles in the right pane expand Logo options and click under the Favicon field. Browse for the favicon version of your logo in your local directory. Obtain a copy of your company logo that would be suitable for use on the Sign In page. Replace the idp-logo.png file in the assets manager by uploading your logo using the same name and relative file size. See Manage your assets for more information. Customize the color of the navigation bar in the header and footer by changing the primary color, as described in Customize the color palette. Upload your own version of the home-background.jpg image to the assets manager using the same name and relative file size (3000 pixels x 1996 pixels). For more information, see Manage your assets. Customize the theme by overriding theme variables or by customizing theme style elements directly in the advanced theme editor. The style customizations that are in effect can be influenced by CSS specificity rules, as described in Understand CSS specificity rules. Override theme variables in the Variables section of the advanced theme editor. For a list of theme variables, see Theme variable reference. In the right pane, click Advanced. For a list of variables that can be overridden, see Theme variable reference. Click x to close the advanced theme editor. View your changes in the preview pane or click Preview to preview the portal changes in a browser. Note: You can click through your portal navigation in the preview pane to view the changes on all pages. 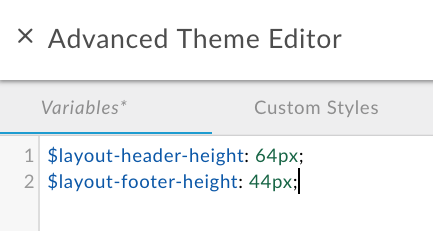 Customize the theme style elements directly in the Custom Styles section of the advanced theme editor. All SCSS style elements are supported. When customizing the theme consider that future updates to the base theme could cause unexpected results. Add your theme styles elements. Close x to close the advanced theme editor. Changing the values described below can impact the usability of the API cards on the APIs page. Make sure that you preview your changes before publishing. Take into consideration the size of the API card images, and length of the API titles and descriptions when defining the values. Note: You can upload an image for the API card when publishing an API. Apigee recommends that you preview all content in your portal before publishing to your live portal. To view your published content in the live portal, click View Portal in the top navigation bar. Use of the !important rule on a style element declaration to override other declarations is considered bad practice and is not recommended. The !important rule impacts the cascading and specificity rules of CSS and can make debugging your style element declarations more difficult. CSS specificity describes the method used by a browser to determine precedence for CSS style element declarations when conflicts arise. CSS specificity is calculated by applying a weight to a specific CSS style element declaration based on its selector type. The more specific the CSS selector, the higher the weight. An ID attribute, for example, will be given a higher weight in the calculation than a type selector. For example, if you define the following style elements in your CSS code, the paragraph element will be colored red because the p style element declaration within a div element is more specific than the p style element declaration. Similarly, if you define the following style element declarations in your CSS code, then any text enclosed in <div class="test"></div> tags will be colored blue because the id attribute style declaration within a div element is more specific than the div style element declaration. For style element declarations with the same specificity, the last style element declaration defined will take precedence. For example, given the order of the following style element declarations, the paragraph element will be colored blue. The following sections summarize the variables that can be overridden in the Variables section of the advanced theme editor, as described in Override theme variables. Customize the foreground colors of the base theme used throughout the site. Valid values are light and dark. Customize the color palette by modifying the following variables to change the primary, secondary, accent, and warning message colors, respectively. See About the color palette categories. The numerical values indicate the shading values for the default, lighter, and darker elements, respectively. View the contents of the material theming SCSS file (material-theming.scss) to identify the predefined color variables. Customize the font family and styles. // If using a custom font, import it by URL. Customize the angular material typography. Each typography level defines a font size, line height, and font weight.